Most hot water recirculation pumps lack temperature adjustment capabilities or their only capable of multiple degree jumps at a time making it nearly impossible for the homeowner to accurately dial-in their desired temperature. With a ReadyTemp you control the temperature set points (50 F to 115 F). Installing a hot water recirculation pump which lacks fine adjustment in temperature control results in either still having to wait for hot water or having to wait for cold water due to over-pumping. By having hot water that's instantly available and at your desired temperature throughout your home you'll all but eliminate excess cold city water from entering your hot water heater. ReadyTemp gives owners total control of both comfort and system efficiency letting themselves decide what is best for their family and lifestyle. 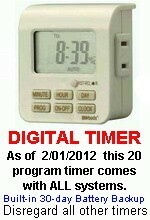 Every ReadyTemp comes equipped with a programmable digital 20 event 7-day timer. Behind the timer is a standard 3 prong outlet. This engineering allows the homeowner to simply unplug the timer and replace it with most any "outlet" control devices available on the market today. Examples include; Day-Of-Week timer, wireless activation, push-button On-Demand activation, X-10 automation, sound activated, motion sensor, occupancy sensor, etc (all controls readily available at local home improvement / superstores). ReadyTemp owners have limitless control types available in which to customize their homes hot water readiness to fit their lifestyle and / or their energy saving needs and the ability to change their control type in just seconds. ReadyTemp's exclusive "check-valve and solenoid valve" prevents bleed-over in both directions, only allowing crossover during an active pumping cycle. Bleed-over is the act when one liquid source unintentionally mixes with a second liquid source as a result of pressure differences and inadequate valve control. Some hot water recirculation pumps utilize a comfort valve with a built-in check-valve to prevent cold water bleeding into the hot water line. Since the cold water lines pressure is greater during hot water usage the aforementioned check-valve prevents the bleed-over from occurring. Comfort valves utilize passive "normally open" thermostatic valves to prevent bleed-over of water from the hot water line into the cold water line. These thermostatic valves require greater then 95F water to continuously contact the valves internal thermostatic materials causing the valve to close and prevent crossover from occurring.. Remembering that anytime 95F water is not contacting these comfort valves, the valve is fully open to easily allow crossover of water from the hot water line into the cold water line. Hot water bleed-over occurs when "any" cold water is used in the home (flush toilet, open tap, water lawn, etc.) that lowers the water pressure in the cold water line forcing the higher pressured hot water line to force any water in the line less then 95F into the cold water line. Thereby, needlessly causing very cold city water to enter the homes water heater to make up for the water which was forced through the then open comfort valve and into the cold water line. This is why so many homeowners complain that they now are having to wait for cold water as well as pay the higher monthly gas bills. ReadyTemp is the result of over 30 years engineering experience in the space industry, 15 years experience engineering recirculation systems and 10+ years experience in Energy Management Systems industry. Temperature Control (ReadyTemp) and management of temperature difference (Delta T). Year after year, thousands of users continue to agree that ReadyTemp's "on-the-fly" adjustable temperature control makes all the difference in the world in achieving comfort and convenience. By far, surpassing all previous experiences with other models on the market. Hot water recirculation comfort is not a one temp satisfies all. Families, businesses and institutions all have unique needs. Making adjustable temperature control "critical" in fulfilling different comfort expectations. A - CONTROL SOCKET 3-Prong Outlet Plug. This socket will accept any standard wall outlet control device. B - CONTROL CORD 2 Prong Power Cord. Plugging in this cord directly without using a timer or other control device makes the ReadyTemp operate by cycling on and off to maintain temp 24 hours per day. Plug this cord into any device plugged in to the 3 prong socket enables control of the ReadyTemp by that control device. C - SINGLE-CYCLE OVERRIDE or ON-DEMAND PUMPING Standard RJ11 Phone Jack. This allows the home owner to easily install a simple doorbell button or other momentary contact switch that matches their home decor. All of these are easily available at home improvement stores an cost $2.00. Simply splice in the doorbell button into the end of a phone cord and plug the other end into the RJ11 jack. As with phones, multiple doorbell buttons can now be easily installed throughout the home by using a 5-plug modular phone adapter. This switch gives the homeowner the means to "single-cycle" override the control / timer for use during scheduled-off time periods. Additionally, this also enables the homeowner to operate their circulation system in an "On-Demand" push-button mode. D - TEMPERATURE ADJUSTMENT DIAL. 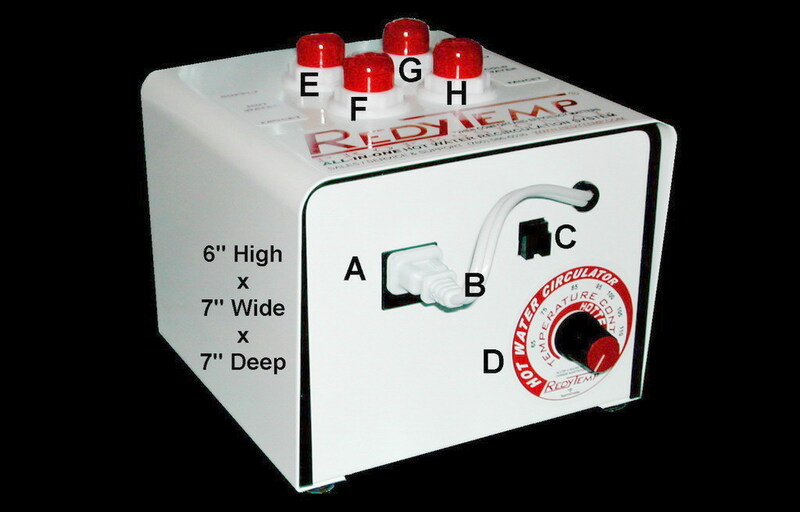 This allows the owner to control their hot water comfort by setting it from 50F to 115F. Since people have unique comfort standards for hot water, this makes the ReadyTemp a win win for builders and contractors. Allowing a homeowner to choose their ideal hot water comfort as well as cold water comfort. Advanced engineering allows the ReadyTemp to work on both a closed loop and an open loop circulation system. On a closed loop system which has a dedicated return line you need only cap-off the two faucet connection ports. It also gives the homeowner control over their cold water comfort by preventing too much warm water from entering into the cold water line.